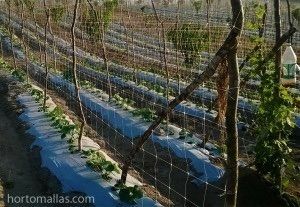 Raffia netting – which is the best option? 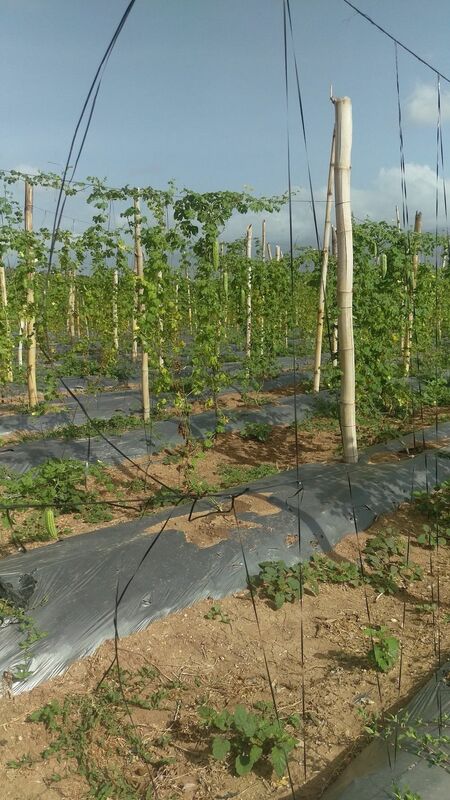 Every farmer obviously needs a trellis netting (raffia netting) which is resistant enough to withstand the weight of the plant’s foliage and fruits and the effects of rainfall and wind. 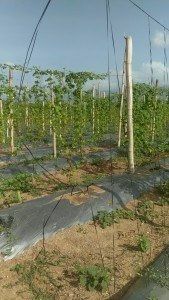 Here we are going to consider some aspects which make using trellis netting more convenient that using raffia netting! 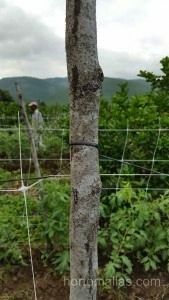 One hectare of trellis netting can be installed by two people in a day compared to the six people needed to install a raffia material. The savings as regards manpower when deciding to use HORTOMALLAS is considerable but the real advantage of tutoring using trellis netting instead of raffia is the phytosanitary benefits, as it reduces the involvement and contact the plants have with the workers’ hands during the tutoring stage, which in turn reduces the amount of diseases that get manually transmitted to the plants when being handled and tutored. 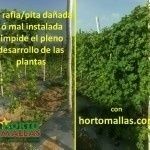 Tutoring using HORTOMALLAS means that the plants grows naturally supporting itself and replenishing itself using the squares of netting. Close-up of HORTOMALLAS fastened to a post in an open field of melons. You can see how the netting is fastened in such a way as to support the rod. The frequent failures with tomato raffia cause whole trellis’ to collapse onto the ground, taking along with it all of the vegetation that it was supposed to be supporting. One strand of raffia thread that breaks has repercussions on the whole crop under that trellis. Agricultural raffia can be cut by mistake when pruning and unintentionally cause a collapse with irreparable damage. In the case of HORTOMALLAS trellis netting however, if by human error one of the strands of the HORTOMALLAS system gets cut, it would only open up around the site of the error, and the wall as a whole would remain in place. Raffia netting is a matter of numbers! A close-up of the end of a furrow of pickled cucumbers using HORTOMALLAS as a trellis along with an insect trap. Click here to see comparisons of raffia with netting or here to see videos of HORTOMALLAS installations.